Born in Riverside California and raised in Inkster, Michigan the 57 year old Detroit singer and guitarist learned his love of the blues from his Jackson Mississippi born mother�s musical brothers. His father was a great Motown fan and took the young Robert to see all his favourites. In 1986 I first learnt of Robert Penn when I bought a copy of his highly sought after Spectrum LP �Mightier Than The Sword� which was recorded by the late great Rudy Robinson. I tried, at the time, to find out more about him but the Spectrum company had gone belly up before issuing the album and no-one else seemed to know where he was. About 10 years later I read a review in an obscure little Detroit newspaper that a Robert Penn was selling a cassette of a live concert which had been broadcast on radio from �Deno�s Museum� in the North Western Michigan College in 1994. A six year hunt eventually led me to Robert and a copy of the cassette. The music from �Deno�s� was fine but a demo copy of his �Live and Mighty� CD was something else. This paired tracks from the Spectrum album with a brilliant concert recorded at the Detroit Montreux Jazz Festival in 1999. I played it over and over again. Later I bought his new solo album �All Alone�Just Me and my Blues� and then we lost contact. That is until I decided to start up the Shakedown series again. 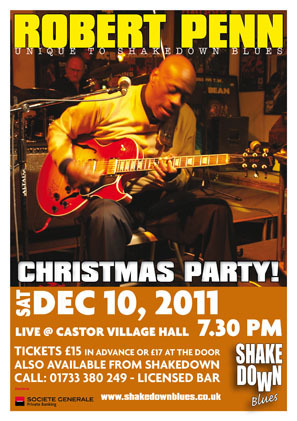 His concert in 2005 at The Village Hall, Castor was a classic lesson of how to triumph in the face of adversity. The pickup band was unrehearsed, most of it�s members had not played together, some hadn�t played for years and none had played with Robert! However Robert�s motto is �Work with what you�ve got� and from the opening bars from his signature tune �My Place� he inspired everybody to play their hearts out. Robert shone, kept the band together and worked his way through his own and B.B�s songbook. The audience loved him and bought loads of CD�s. Since then Robert has been back twice and each time he has managed to surprise and captivate the audience with something new and to quote Caroline's review of his second concert in 2007 "Who will ever forget him directing the band in a long build up for �Shaft� or the audience�s incredulity when he tackled �What A Wonderful World� "
Last year Robert left the stage with the audience braying for more and immediately I booked him for the Christmas Party in 2011. Get your tickets early to avoid disapointment!